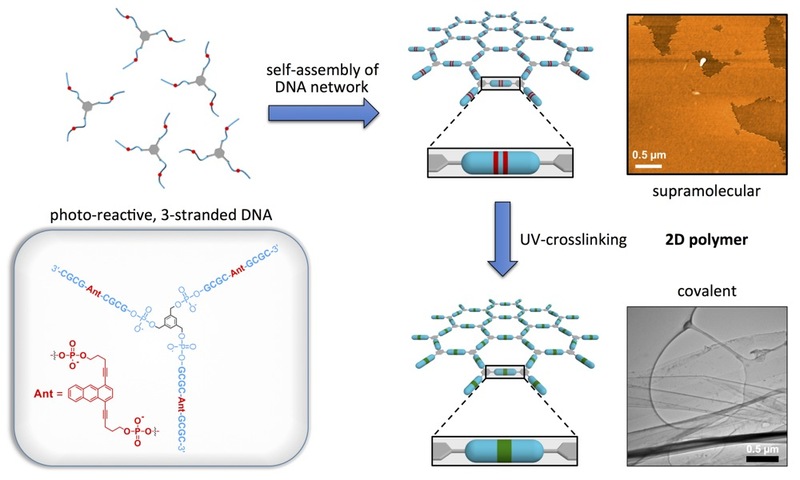 A DNA-based monomer self-assembles into a supramolecular network, which is further converted into the covalently linked two-dimensional polymer by anthracene dimerization. The polymers appear as uniform monolayers, as shown by AFM and TEM imaging. Furthermore, they exhibit a pronounced solvent responsivity. The results demonstrate the value of DNA-controlled self-assembly for the formation of two-dimensional polymers in solution. This work was carried out by Dr. Hao Yu in the group of Prof. Robert Häner in collaboration with Prof. Ulrich Aschauer and Dr. Duncan Alexander (EPFL). 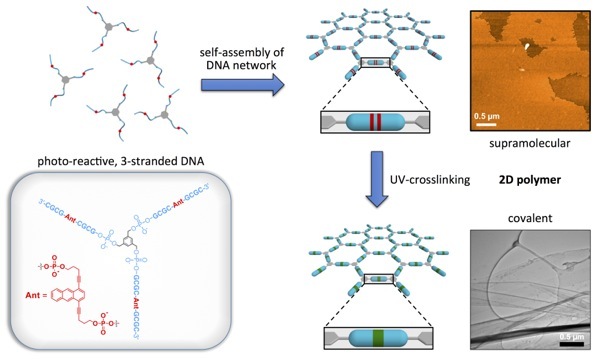 "Synthesis of Responsive Two-Dimensional Polymers via Self-Assembled DNA Networks"
Angew. Chem. Int. Ed., 2017, 56(18), 5040-5044; doi:10.1002/anie.201701342.